Mist rose likes wisps of smoke from the surface of the cool water which mirrored the grayness of the sky. Ducks were still asleep at water’s edge, with beaks tucked under their wings. The paved trail I ran on greeted me with its solitude and the wind that blew across the open places was sharp and clean. Running had not been a priority for the last five weeks, while my husband, Brian, and I took turns helping his dad care for his mom. We laid her body to rest the day before, but her soul, we knew, was already with Jesus. 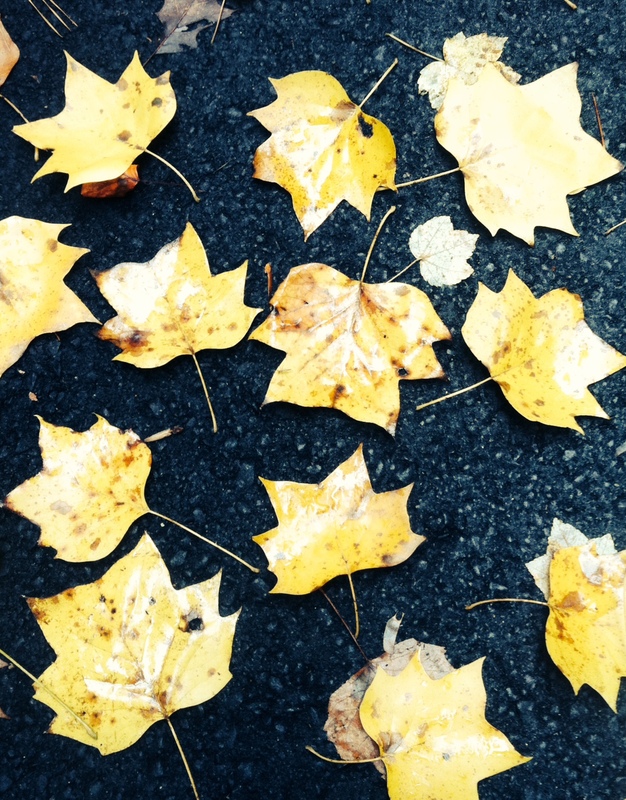 The pavement under my feet was scattered with leaf splashes of color. A few sections of the path had been recently repaired. The black, smooth patches of tarmac hinted at cracks and holes beneath. Bright yellow leaves glowed against the dark surface, the contrast more vivid than that created by the leaves which rested on the older, gray sections of pathway. The death of someone you love leaves a hole in the fabric of your life. Even in the life of believers, the physical death of one you love is painfully difficult to bear. The darkness of it is lightened only by the promises of God and the splashes of His glory. Marilyn was diagnosed with terminal brain cancer on May 5th. The disease took her physical life in less than 6 months. Although prayers for healing were not answered, many others were. A basket sits in her house, overflowing with hundreds of cards sent to her by family and friends. The words written on the cards, the meals loving made and all the other actions put to life were God’s love and comfort, flowing from His heart and through the hands of His people; splashes of His glory scattered continuously along her path. God’s glory also radiated through the life of a humble man, her husband, Dan, who loved her most of all. We were privileged to see him care for her with great devotion. This was most vivid during the nights when we were up and down many times to help her. Even in his exhaustion, he had a kind word for her, told her she was beautiful, kissed her cheek or made her laugh with a corny joke. As I watched them, “for richer or poorer, better or worse, in sickness and in health,” played through my head, and I knew these words were being enacted as they were meant to be. God calls husbands to love their wives “…just as Christ loved the church and gave Himself up for her…” (Ephesians 5:25) We saw God’s glory shining out of Dan’s heart; as he lived the Word and loved his wife. The most beautiful splash of God’s glory was evidenced in Marilyn’s faith. Her journal entries recorded her belief in God’s love up until the day her hands were no longer able to write. Even in the valley of the shadow of death, she trusted Him. By doing so, she left a legacy for her granddaughters, an example of faith, tested by fire. When they encounter trouble in this world, surely they will remember that their Gram still loved Jesus when her world was turned upside down. Marilyn left a trail of a life well lived, apparent by the many friends and colleagues who still grieve for her. Her footsteps in their lives reflected God’s print on her life. One of her last wishes was that someone would come to her memorial service and accept Jesus as their Savior. God was glorified during her service, and an invitation was offered. Perhaps, one day in heaven, someone will tell Marilyn that her wish came true. Maybe you are reading this post and feel the Spirit tugging on your soul, because you have not yet chosen Jesus. Respond to Him, for life on this earth is fleeting and fragile. You don’t have to be in a church or in front of a pastor. Just recognize that you are a sinner who needs forgiveness. Believe Jesus died to pay for your sins, and confess to Him. Then, tell someone about your decision. It’s news too good to keep secret; for with this choice, you’ve gained eternal life! We’ve visited what “If” means, we’ve glimpsed how to deny self, and now, we stop along the trail again, so you can set in your mind what it means to pick up your cross. Very simply, I believe it means we are to be like Jesus. He submitted His will to God; lived His life and died His death for God’s purposes. The Garden of Gethsemane was His crucible, wherein His submission was critically apparent. We are to live for God from our core, willing to be molded so that our heart and hands align with His will. If we do this, then the cross falls naturally on our shoulders, in many forms. It could mean bearing a terminal illness without cursing Him, but loving and trusting Him in spite of it. Speaking for Him may incur ridicule or rolled eyes, serving Him may deliver hardship, living for Him may mean we don’t “keep up with the neighbors.” Embracing His choices may mean we give up our schedules and desires in exchange for His. If we allow ourselves to be shaped, than God will mold us into an image of Jesus, and will strengthen us to bear whatever cross we are to carry. We must trust Him and believe that His promises are true, and that His plan for us has higher purposes than ours. The first step to picking up our cross is to assume a posture of submission, as Jesus did: head bowed, back bent, shoulder ready. Heart, ready to trust; hands, willing to move; eyes, eager to see God glorified in the darkest of times. Do this in His strength, for human strength fails, time and again. Splash your path with the colors of His glory, so that others cannot miss seeing the vivid contrast and want The Light for themselves. Walk with me again, and we will stop at the next overlook to study the final part of Matthew 16:24.